How did I get to Lagos, Nigeria? It began in a strange way with my husband. In 1962, Esuakema decided he wanted to return to the Ministry of Information in Lagos after years in New York. So, one early November day, we were off to Lagos on a French boat from New York City. It was a choice by him to have a longer journey and a different experience from taking a quick plane ride. The journey took two weeks, and we took all of our possessions and our American car with us. I was seasick almost every day until we got to Ghana, the first stop on our long journey. So my first taste of Africa was Ghana. We arrived at the port city of Tema, which had just been built that year. There, we got off the boat to see this shiny clan new port with the azure sea around. I could hear drums in the distance. I was very excited as these were my first footsteps in Africa. We explored Tema on our short stop-over, walked eagerly from office to office and found there was no air conditioning: it was about 100 degrees and very sunny. The ladies were dressed in multicolored clothing with head ties and the men were in heavy wool suits. The port was clean, a tribute to Kwame Nkrumah, the president of Ghana. We returned slowly back to the boat which took us on to Lagos, Nigeria. 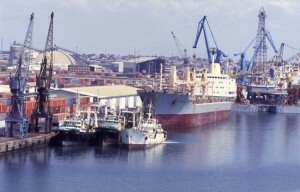 Two weeks later, we arrived at Lagos Port. What a contrast – it was a dirty, crowded old port with a lot of activity unlike Tema’s. We went through the immigration procedures easily as Esuakema was a returning government official. It was all a blur for me. A detail from the Information Ministry met us and took us to the Federal Palace Hotel in Victoria Island, a very sophisticated area in Lagos. And that evening, many of my husband’s friends came to see us. They talked a lot about the state of affairs in Nigeria, and the corruption that was beginning. The head of state at that time was Tafawa Balewa, and Nnamdi Azikwe was the president of the country. Later that week, we were given a temporary apartment in a complex called Ledgco Flats until we located our own apartment near the Palm Grove Estate on Ikorodu Road, another exclusive area of Lagos. My husband wanted “a nice environment” for his wife, as he told friends. As soon as we got our things from the boat, we began to live the Lagos life. We had three bedrooms, a living room and a dining room in a building made of concrete blocks that had two other apartments. It was fenced around with a boys’ quarter at the back. Many Nigerians have servants who can be called on to help when needed, and quarters are usually provided for them. We engaged a young man to assist with the cleaning of the house and preparation of the Nigerian dishes. His name was Akpan, an Ibibio man from the same area as my husband. He worked so hard from morning to evening that we paid him a good salary, and my husband’s friends felt that he was overpaid. In the beginning, Esuakema accompanied me to the markets and the market women would laugh at him because men at his level in this society were not expected to be in the market shopping. “Oga (Sir),” they would say, “why you no send the house boy to the market with madam?” The women spoke broken English and were richly dressed. I can still smell the peppers, the paw paws, plantains, the fresh fish and the meat that was baking in the sunshine at their market stalls. Lagos life for me was fun and full of activity. In the evenings, we would go out clubbing with friends. The music of this time was High Life, Juju music and lots of Yoruba music, as Lagos was a Yoruba town. 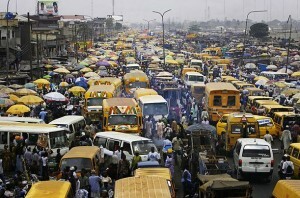 Lagos was the capital of Nigeria with lots of different ethnic groups and international residents. In its heart and soul, and at the heart of the town, it was a Yoruba city. The Yoruba have an old civilization. What is notable about them is that they have a tendency to form into large cities; most of the larger cities of Nigeria are inhabited mainly by the Yoruba (Lagos and Ibadan) Their cities are usually controlled by an Oba or King and their councils. Their religion (Ori) and culture is found in the Americas as a result of the slave trade. It has given rise to Santeria in Cuba and Candomble in Brazil and Vodoun in Haiti. One of the things that I noted was their traditional manners that could be seen on the streets of Lagos and in their homes. When greeting an elder, a man bows and a woman has to curtsy. If a person is royalty, a woman must kneel and the man prostrates himself and then gets up. There is also a system of greeting: people have the time to say good morning and ask after family . . . and actually answer! I began to realize that we from the Americas have lost so much of the civility found in Nigerian society. The other things I noted was the pouring of libations to the earth venerating the elders and the breaking of kola nuts on special occasions. I saw these things also in the eastern part of the country. Many Yoruba follow their traditional religion called Ifa and consult with “babalawo,” or father of secrets. However, many Yoruba are Christian or Muslim. I had to admire the women. They are richly and colorfully dressed in their traditional attire. And like most of the country in those days, and until today, Nigerians are really friendly people and like to enjoy themselves. Lagos in 1962 was peaceful and livable, not crowded as it is today. The money was still the British pound. Shortly, the pound gave way to the Naira, the Nigerian currency. In the early 60′s, oil had yet to be discovered, and the country depended on palm produce and groundnuts for export. Finally one day, I felt comfortable enough to go out by myself to the small local market near our house. As I walked, people followed me and then began to play drums. They followed me from table to table and began singing also in Yoruba. I began to feel uncomfortable. I fled from the market. When I told my husband, he laughed at me and said you are wearing slacks. “I think you have forgotten that you are in a small Lagos market and the people are not used to seeing women in pants.” This was, of course, Lagos in 1962, a traditional society in a world that still had not heard of the women’s liberation movement. Nigeria of today has changed a lot, and women wear what they want and are very liberated. I can remember my sensations initially when I arrived and began to explore the city. It was invigorating and enthralling to see so many black people, so many bright colors of clothing and hear so many languages. I think, as I recall back, that I must have suffered culture shock. The streets were crowded and there was lots of traffic even then. However, I soon began to enjoy Lagos life. In the evenings, we would go to the Island Club to socialize, to the movies and to visit friends. The Island Club, I discovered, was founded in 1943. The club has 7000 members. It is a place to meet the movers and shakers of Nigeria. It provides meals and drinks and membership is by invitation only. The Island Club was a multi-racial club, with the President of Nigeria as the Grand Patron. Esuakema was a social animal and was always in a club where he could go to after work, have a beer and hear the latest gossip. In New York earlier, he joined the Press Club and at Calabar, later, he was a member of the African Club. The clubs all provided opportunities for the families to have a meal and relax. At the universities where he taught, there were staff clubs, but these clubs usually had tennis courts and swimming pools. In some ways, the elite of Nigeria lived the life of their former colonial masters. When it came to food, my transition to Nigeria was unusual. I got used to the hot pepper and spices in the food that most Yoruba families would use to prepare their meals. I can recall our first dinner out with friends. Temi, the wife of a friend, had prepared a red sauce with chicken and rice and I ended up coughing and crying and everyone could not stop laughing. My favorite Nigerian foods then and now: akara, puff puff, coconut rice, moi moi, afang soup, eguisi soup and okra soup with gari. Lagos of those days gave me a continuing love of Nigeria. There was a vibrancy and the people I found had a pride in themselves and a certain energy, full of hustle and bustle. They imparted to me “a can-do spirit’” for which I am ever grateful. Those early days were before the negative regimes that dampened the spirit of the people. This excerpt is part of a chapter from Heloise Oton’s upcoming memoirs of her life in Nigeria from 1962 to 1986. Her book will be completed by the end of the year. You can contact Heloise Oton at 718-638-4288 or at info@calabar-imports.com. She will be available for readings and lectures this fall. nigeria is a great nation ,and a home of peace and unit.a land honore. Heloise, I look forward to talking with you & learning more about Lagos, Nigeria.